This is not a new craft, but it is the first time we have done it. So, therefore, it is new to us! Over the last couple years I have noticed crafty moms making fun shaped crayons for Valentine's gifts for their kids' classmates. I have only 2 of my 3 kids home this week, so I thought I would try something different. Pinterest is a great starting place for inspiration. Yesterday, I made a Pinterest cookie recipe. Today, I tackled a craft. So, at one completed pin a day, it will take me just under 10 years to make all my current pins. This doesn't include pins I may add tomorrow! Hey, one is better than none! This pin - Crayon Hearts - is the cool crayon pin that inspired me to make crayons with my kids tonight. 5. drop the colours randomly into the mold. (The instructions I read said to fill it only 1/3 full, but next time we are going to try filling it to the top to get fatter crayons). 6. Put the silicon mold on a cookie sheet and put the whole thing in the oven for about 15 minutes. It went faster for my oven. 7. Remove tray carefully so the colours don't slosh together while they are still in liquid form. 9. 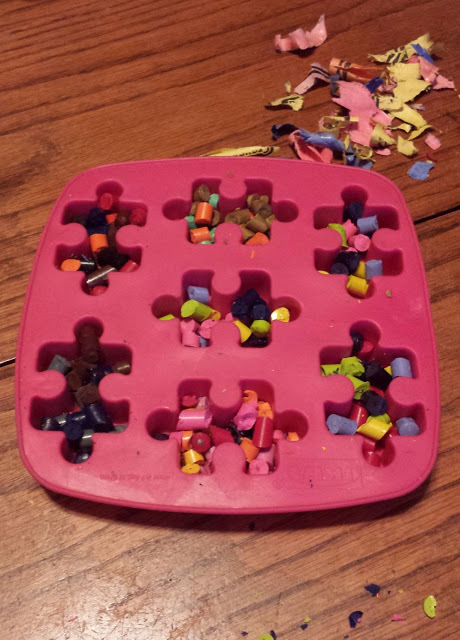 After they had been allowed to cool for about 30 minutes, I carefully took the crayons out of the mold and laid them out to completely cool. In the morning, we will try them out on paper. If nothing else, we have created some cool puzzle pieces. 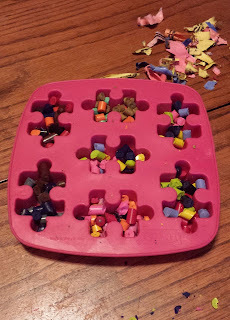 The silicon mold is designed for ice cubes, but now we will just use it for crayons and crafts. The crayons really stained it. I found they are too big for ice cubes, anyway. 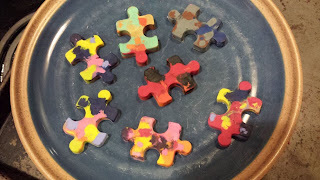 This was such a simple little project, but the kids were giddy with excitement to see the transformation of their crayon bits into one big crayon. And, you don't have to get a whole bunch of supplies to make it. Most people with kids in the house have crayon bits in drawers and craft cupboards. The mold I used is from IKEA, years ago, but you can get similar things from the dollar store, I believe. Make sure it is a heat resistant mold!! Otherwise, you will have more than just crayon art happening in your oven!